Soup is an excellent meal for dieting people, a bowl of warm soup is definitely very filling and satisfying while the weather is down outside.Soups and salads have their important place in our daily menu,yes i couldnt stop myself saying this phrase again and again. 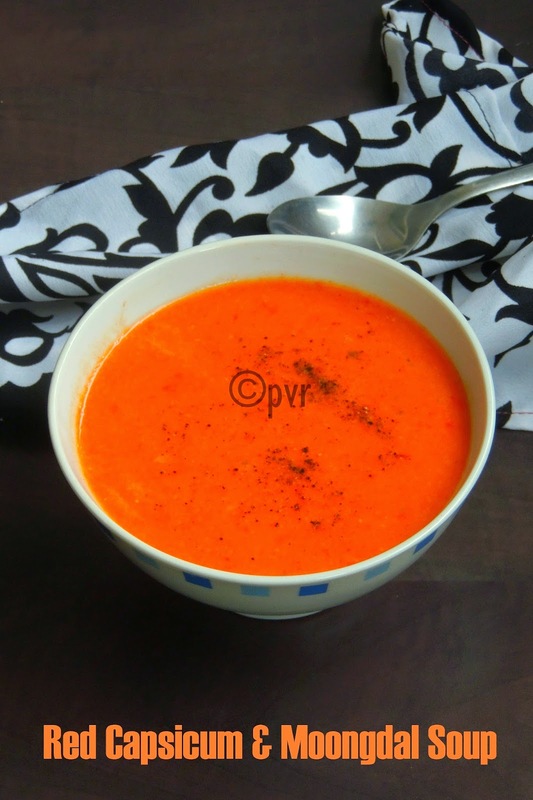 I do often soups for our dinner.My today's soup goes under the list low-carb meals, yes this soup goes for one of the low carb vegetable Red capsicum and its completely potato free, cream free. I replaced the potato and cream with yellow moongdal in this soup, usually i'll add potatoes to make my soups thick but trust me moongdal works wonder for making this delicious soup. Obviously this soup is completely vegan and definitely a satisfying meal for people dieting under low-carb diet . Its been a while i want to give a try to a soup with red capsicum and yellow moongdal combination, finally i did this beautiful comforting soup with this pair few days back for our dinner. This vegan and eye pleasing soup makes an excellent dinner if served simply with a sandwich, but however this soup goes for this week's blogging marathon as i chosed low-carb meals for this week's theme.Check out the Blogging Marathon page for the other Blogging Marathoners doing BM#42. Sending to Pari's Only - Gluten Free Cooking. Heat the oil in a pressure cooker, add the chopped onions, saute for few minutes. Add the chopped red capsicum, cook for few minutes. Meanwhile wash the moongdal,saok with enough water. Once the veggies gets half cooked, add the soaked dal, enough water, salt. Bring everything to boil. Close the cooked with lid,put the weight. Cook upto three hisses, once the steam gets released, blend the soup with hand blender. Finally add the pepper powder, give a stir and serve warm. I love the clicks they are so capturing..and it surely is a great idea to use moong daal to thicken the soup. The soup looks fantastic. I DO LIKE THE SOUND OF IT..BY THE WAY, NOW THAT MY TODDLER IS ALLERGIC TO EGGS, I'M GONNA HAVE TO DIG IN YOUR PREVIOUS EGGLESS RECIPES! Love the combo of this yummy soup...feel like having one bowl right now . I am a soup person. This looks wonderful. Je n'ai encore jamais fait de soupe aux poivrons. Ca doit être délicieux. A tester et très vite. Soup has vibrant color and luks appetizing..i will finish a bowl of it..
Soups are a great option for meal..very nice clicks priya.. 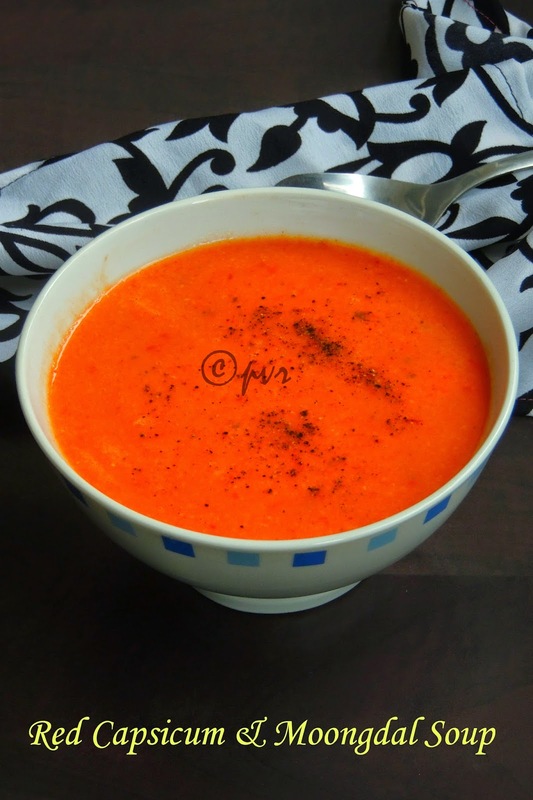 Healthy and comforting soup.. Lovely vibrant color.. Such an intense colour and it looks so lovely. Love the color of the soup! Very tempting.